“Also I want thank my wife and my two sons for their support." Fiji Rugby Coach of the Year winner Senirusi Seruvakula during the FRU Awards night at the GPH Suva on February 9,2019.Photo:Simione Haravanua. 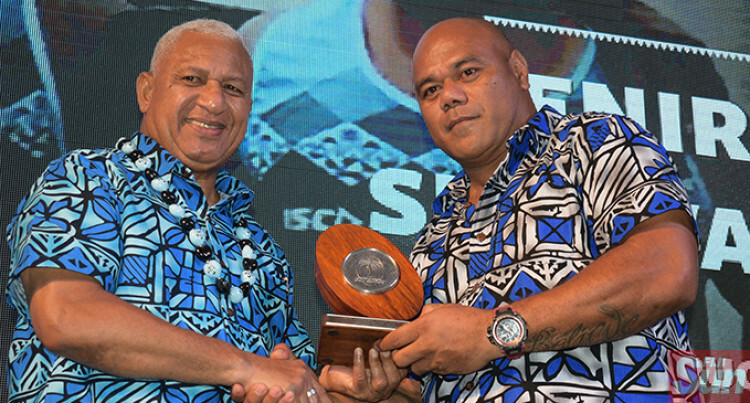 Fiji Rugby Union Coach of the Year Senirusi Seruvakula dedicated his award to his late dad Ratu Semi Seruvakula who was instrumental in his rugby career. “This is dedicated to my old man who passed away in December and also my mother for being support­ive in my rugby career,” he said. “Also I want thank my wife and my two sons for their support,” Se­ruvakula said. The late Ratu Semi had been sup­porting Seruvakula’s rugby career since kaji rugby. “One thing they always tell me is whatever I do, I must remember that loyalty is the best policy,” he added. Seruvakula started his rugby career at Delainamasi Primary School before he joined Queen Vic­toria School. He was part of the school’s team from the Under-15 to the U19 grade. He led the Victorians in the Deans Trophy U19 competi­tion in 1991-92. One of his memorable moments of his playing career was being captain of the Naitasiri provincial side for three years and defending the Farebrother- Sullivan Trophy every week in 2008. The Nasautoka, Wainibuka, na­tive holds a World Rugby Level Three coaching certificate and Lev­el One strength and conditioning certificate. His memorable moment in his coaching career was guiding the Fiji Airways Drua team to lift the 2018 Australia National Rugby Championship title for the first time. This year Seruvakula believes would be a tough year for him as changes will be made in the squad from last year. “There will be changes a lot of players from 2018 have gone over­seas so it will be different and will be a tough year for the Drua. Fiji Airways Drua and Flying Fi­jians halfback Frank Lomani dedi­cated his success to his two sisters in Nukubalavu, Savusavu. Lomani received the 2018 Fiji Rugby Domestic Player of the Year award. “To be honest I was not expecting this award but to be nominated to be domestic player, I’m very happy. “I want to dedicate this award to my two sisters Joey and Lewa in Sa­vusavu,” Lomani said.